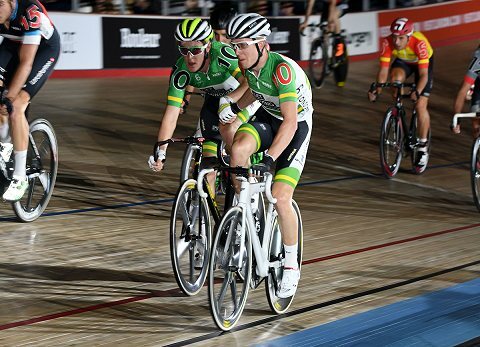 Six Day London was blown wide open in the final Madison Chase of Day 2 as Australians Callum Scotson and Cameron Meyer finished second to take a narrow overall lead. Sitting outside the top three before the night’s final race, they were one of only two pairings to take a lap in the closing Chase, with their result enough to put them just four points ahead of the race winners Yoeri Havik and Roy Pieters in the overall standings. Scotson and Meyer finished third on their Six Day London debut last year and have already stated their aim is to top the podium this year – with a second-day lead further evidence of their intent. Day 2 began for the Six Day riders with a 40-lap derny victory for world omnium and Madison champion Benjamin Thomas – crossing the line ahead of Niklas Larsen and Peter Kennaugh. And Larsen continued his impressive form with a sterling 20-minute Madison Chase victory alongside Casper von Folsach, with Spain’s Sebastian Mora Vedri and Albert Torres taking second. And there was more Danish success in the next race as Marc Hester and Casper Pedersen set the fastest time of the night in the two-lap Madison time trial to move to the top of the leaderboard with half of the teams now having set their time. Mora Vedri and Torres further asserted their authority in the team elimination, with the former beating Thomas in the final sprint to take the win and move into the Six Day London overall lead. But they suffered in the 10km points race as Mark Cavendish got the crowd on their feet with a consummate points race performance – taking a lap with four other teams and racking up a total of 38 points to win the race ahead of Australia’s Callum Scotson von Folsach. “It’s only 40 laps so if I can’t boss that then I may as well give up my day job!” said the three-time world Madison champion. The penultimate race of the night saw Kenny de Ketele take a narrow victory over Cameron Meyer in the second 40-lap derny heat of the night and put the Belgians back into overall control going into the final 45-minute Madison Chase. The Six Day London lead changed hands twice in the opening third of the chase with first the Australians in the hotseat with their lap gain before Havik and Pieters stole a march on the rest. But their finish in the final sprint was enough for Meyer and Scotson to leave the Lee Valley VeloPark with a smile on their faces. Away from the endurance riders, it was Kiwi Eddie Dawkins that ruled the sprinters’ competition, setting the fastest 200m flying lap time trial with a mark of 10.222s. He went on to beat Juan Peralta in a hotly-contested, shoulder-to-shoulder match sprint to move to within a point of the Spaniard in the overall standings. “That was two guys being as reckless as possible, trying to stop the other man get to the finish line first,” he said. Dawkins’ countryman Ethan Mitchell still leads the standings, however, after a second-place finish in the keirin – behind newly-crowned European champion Maximilian Levy – put him five points ahead of Peralta.